If you are a frequent reader of our blog, you know that we cover a wide variety of lighting topics ranging from spotlighting products to answering frequently asked questions. With LED technology continuing to advance at a rapid pace, there are many interesting and unique products that we simply do not get a chance to fully cover. In this post, we will explore some LED products you may not know exist. Labeled with the letter “G” followed by the measurement (in millimeters) between the pins. Has one metal contact on the base of the bulb. Has two metal contacts on the base of the bulb. Specialty bulb that can only be used in a festoon socket. Has enclosed pins and “wedges” down into the socket. Has a screw base that measures 12 millimeters. Has a screw base that measures 17 millimeters. Has two pins that have been formed into loops. When choosing a bulb, measure your fixture to ensure there is enough space for the bulb to fit. LED bulbs may be longer or wider than the bulbs they are replacing. 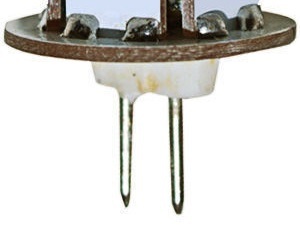 Also make sure to check the voltage of your fixture, as these mini indicator bulbs range from 12 Volts to 120 Volts. 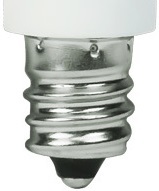 In addition to under cabinet lights, LED mini indicator bulbs can be used in boats, vehicles, and RVs. Look for bulbs that are waterproof when choosing LED mini indicator lights for boats and other applications where bulbs can come into contact with water. 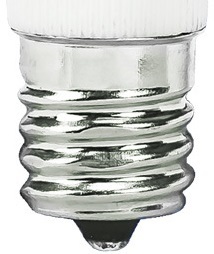 Screw-based bulbs can be used in wall sconces, ceiling fans, chandeliers, and other similar fixtures. 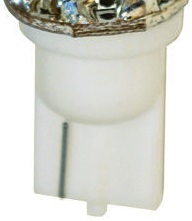 Hazardous location LED corn lamps require the removal of the ballast during installation, reducing maintenance costs. These LED lamps employ active cooling technology to help dissipate heat and feature a clear outer case that will contain an internal explosion. 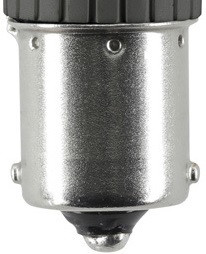 Use these lamps in aircraft hangers, gas stations, utility gas plants, and refineries. If you work in the food industry, you likely know that the FDA requires shatter resistant bulbs in areas around food and equipment. Did you know that many of our LED tubes that can be used in these areas? Shatter resistant LED tubes have a shatter resistant coating that meets NSF International (formerly called national Sanitation Foundation) certifications. This coating traps glass shards in the event of a breakage, keeping foods, surfaces, and appliances safe from broken glass. Use these lamps anywhere broken glass could pose a hazard including manufacturing facilities, schools, and daycares. Shatter resistant LED tubes are available in three types. Plug and play lamps work with your existing ballast, making these the easiest to install. Direct wire lamps operate directly off of the line voltage, meaning that you have to remove the ballast and rewire the fixture during installation. 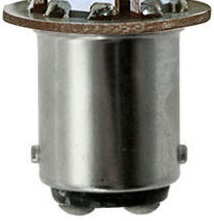 This eliminates ballast maintenance costs and compatibly issues, as well as a potential failure point for your fixture. Hybrid tubes initially work with a compatible ballast, and can then be reinstalled later as a direct wire tube once the ballast reaches the end of its life. Are the fluorescent lights in your walk-in cooler, freezer, or display case not bright enough? Replace your existing system with these LED cooler and freezer fixtures. 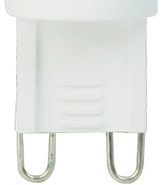 These lights hardwire directly to the line voltage and up to 10 lights can be interconnected. LED cooler lights are designed to withstand temperatures from -4 to 140 degrees Fahrenheit, vibrations, shocks, and corrosion. The integrated LEDs produce very little heat and no ultraviolet (UV) light, significantly reducing cooling costs. Choose between fixtures that produce a 4000 Kelvin cool white light or a 5000 Kelvin stark white light that is similar to daylight. Another type of LED lights you may not be familiar with is our specialty rope lights, consisting of flexible neon rope light and hybrid LED flat rope light. Flexible neon rope light is an LED alternative to classic glass neon lights. Lasting up to three times longer, these lights simply plug into a nearby outlet and do not require ballasts or a specialist to install. Use neon rope light in a wide variety of applications including outlining buildings or relighting old neon signs. Hybrid LED rope light is designed with the flexibility of rope light and the brightness of LED tape light. These lights emit a bright light measured in Lumens per foot giving these lights the potential to light a small space. Flat rope light can be easily installed to light patios, decks, stages, and other locations. Both types of specialty rope lights can be used outdoors as long as they remain uncut. Once cut at the marked cutting points, the UL listing is voided and any connections made must be shrink wrapped. Do not go over the maximum run limit when installing these lights. A single run of neon rope light can be no longer than 150 feet, and flat rope light cannot exceed 146 feet. 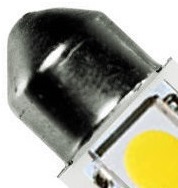 Are there LED lights that you are curious about and would like to see covered in more detail? Let us know in the comments below. You can read about more new and interesting products by follow our Facebook, Twitter, Google Plus, LinkedIn, or Pinterest pages.